In this article you’ll learn exactly who you should be interviewing, where, and how to find them. Make sure you’ve read Early Adopters Part 1: Who They Are. It’s fundamental you understand the underlying principles of “Early Adopters” before you dive into Part 2. Are actively seeking solution for it. …and Early Adopters are the secret to building a successful startup. If you can find Early Adopters, people who are actively seeking a solution to the problem you want to solve, there’s an incredible fit between both of your needs. You need them to build a business and they need you to solve their problem. You’ll get to collaborate with your Early Adopters to build a mutually beneficial startup. On the other hand, if you’re not able to find your Early Adopters, you know from Part 1 that you won’t be able to lock in your Early Majority. This means, you won’t find Product-Market Fit. If you’re not able to find people who are actively seeking a solution to the problem that you want to solve right now, the world isn’t ready for your business yet. It doesn’t mean you’re starting a bad business if you can’t find Early Adopters, it just means the timing isn’t right. How Do You Find Your Early Adopters? Where are they seeking solutions? Let’s say, your startup wants to reduce the impact of climate change, so you want to help people commute to work without the use of cars/Uber/Lyft/etc. You’re targeting urban workers and think if you could help people take their bikes on the subway, it would make a significant impact. To find your Early Adopters (i.e. people already seeking a solution to this problem), first ask yourself, what are the behaviors of someone who is actively seeking a solution to this problem right now? In other words, where would a person who says, “It’s a pain to take my bike on a subway” look for a solution right now? These actions make up your Solution Seeking Behaviors list. Maybe, they’d buy a folding bike or ride a mini bike. Maybe they’re asking other people for advice on forums. Or maybe they use their normal bike and just wait for a spacious subway car before getting on. How do you talk to them? It’s critical you talk to the people who demonstrate these behaviors to see what problem they are actually trying to solve. Just because someone buys a folding bike, doesn’t mean they bought it to solve problems getting on a subway. They could have bought a folding bike because they have a lot of stairs leading up to their apartment. Or the subway was their motivation for buying a folding bike, and it completely solved their problem (i.e. they’re no longer Early Adopters because they’ve found an ideal solution). You need to interview the people who you think are trying to solve the problem your startup is tackling to confirm they are actually your Early Adopters. In the folding bike owner’s example, we’d want to talk to several of them to validate whether getting on the subway was the reason they bought their bikes. Of course, we don’t exactly have a list of everyone who has bought a folding bike, so how do we find them? The next step is to convert Solution Seeking Behaviors to, what I call, Externally Observable Behaviors. 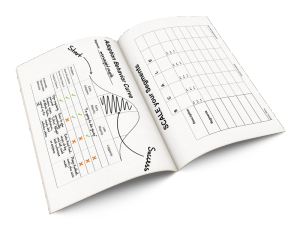 You started with behaviors that may indicate someone is trying to solve a problem. If you turn a Solution Seeking Behavior into a behavior an “External Observer” (i.e. you) can identify, you’ve probably found an Early Adopter. What if, instead of targeting everyone who has bought a folding bike, you reach out to people who have left reviews on Amazon saying something like, “I bought this to help with my subway commute, but it takes too long to fold up and it’s too heavy to lug up and down the stairs.”? In this case, you’ll have found someone who clearly is trying to solve the bike and subway problem, and because they’re leaving negative feedback about it, there’s a good chance they’re still actively trying to solve this problem. What if you find someone who’s blogging about what a pain it is to take their mini-bike on the subway? This person is actively trying to solve this problem and still hasn’t found a great solution. Neither have any of the people who share that blog post on Twitter, or who comment on the blog post! What about someone who has posted on Reddit asking advice from others about how to solve this problem? This behavior means they’ve self-identified as an Early Adopter and they’re looking to solve this problem. What if you go hang out in the subway and see if bike riders actually wait for empty cars before getting onboard? You can have a short conversation with these people to see what problem they are trying to solve. You can see, this list of externally observable behaviors helps you answer the question: where do you find your Early Adopters? The answer is written within each of these behaviors. You find Early Adopters in the places that they are trying to solve their problems. In the biking example, we’d find them on Amazon, Twitter, Reddit, and in the Subway. Once you write down the externally observable behaviors—things that you as an outsider can see—you know where to find your Early Adopters. Focus on the people who are seeking a solution to the problem right now. Ask yourself what behaviors these people would take to seek out a solution to their problem. Turn those Solution Seeking Behaviors into Externally Observable Behaviors and go where the Early Adopters are. Once you know the Externally Observable Behaviors of people actively seeking a solution to the problem you want to solve, you’ve discovered where to find your Early Adopters. 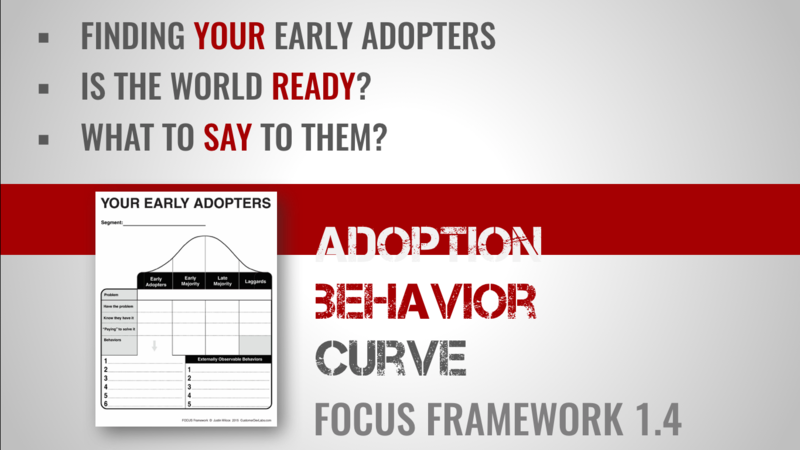 Check out the second half of the Adopter Behavior Curve, the 4th exercise in the first FOCUS Framework workbook series. It will take you step by step through the process of identifying your customers’ Externally Observable Behaviors, so that you know where they are and how to reach out to them. Alright, my friends, now that you know where to find your Early Adopters, go help them solve their problems! Thank you Justin! This helps a lot! Thanks Justin. Your advice is always so valuable & timely!